VeriFone’s MX830 is the robust payment device multi-lane retailers have waited for — a versatile, durable, economical performer tuned to multi-laneand integrated point-of-serviceenvironments. The consumerfacing device provides transaction speed, reliability, flexibility, and security — together with attention-getting brand reinforcement and promotional messages, delivered directly to the consumer. The MX830 makes quick work of even the most complex payment and value-added transactions.It has a familiar, intuitive interface and a recessed keypad for privacy during PIN entry. 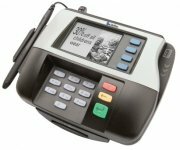 The MX830 also offers an optional touch screen that accepts stylus or finger input, as well as signature capture capability to streamline transactions. More than a payment device, the MX830 helps retailers reach out to consumers with timely, targeted branding and crosspromotional messages. The high-resolution grayscale display supports graphic animation, as well as helpful prompts and transaction information. The MX830 is exceptionally durable and stands up to heavyuse environments. Keys arelaser-etched to preserve letters and numbers. The touch screen uses specially hardened glass that resists scratching for a clear view over the life of the device.The non-mechanical stylus has no moving parts or electronics to fail. Plus, field-replaceable modules allow the addition of contactless payment or emerging technologies to preserve investments over time. A smart card reader is factory optional.Global and secure, the MX830 is designed to meet PCI PED, EMV Level 1 & 2 approvals, and Interac certifications. Add a Replacement or Extra Touchscreen Pen Stylus to avoid downtime.